BRIC - What Does It Mean? 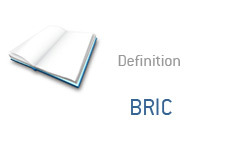 What is the definition of BRIC? Which countries constitute BRIC? Who coined the term BRIC? What do these countries all have in common? They all possess developing economies that are growing at a fast pace. In addition, all four countries have massive populations. According to Wikipedia, the term BRIC was first coined and used by Goldman Sachs in 2001. According to Goldman Sachs, the four BRIC countries will have tremendously large GDPs by the year 2050. You can see why these four countries are going to become increasingly important (and powerful) over the coming decades. China alone will have nearly TWICE the GDP of the United States according to the projections from Goldman Sachs. That's unbelievable. You can expect more and more cooperation between the BRIC countries over the coming years - the group just recently held their first formal meeting in June of 2009, when they jointly called for the advancement of a "multipolar world order".